After a loss in Game 3, the 24th-seeded ’84-’85 Capitals found themselves down two games to one in the series. However, they would win Game’s 4, 5 and 6 in overtime with two of those overtime winners coming from the same player. All this despite the fact that the 9th-seeded ’81-’82 New York Islanders narrowly out-scoring the ’84-’85 Caps 24-23 during the series. It was basically a one man show offensively for the Isles as Mike Bossy doubled the next-highest scorer for New York. His 16 points were a team and series-high and the next-highest scorers for the Islanders were John Tonelli and Bryan Trottier with eight points apiece. Defenseman Denis Potvin was the only other Isle to average at least a point per game during the series as he finished with six points. Bossy was also far and away New York’s best goal-scorer with his 10 while the next highest was Tonelli with only four goals. Trottier ended up as the team’s top playmaker with seven assists while Bossy, of course, was second with six assists. In goal, Billy Smith did not have a good series. He posted a 2-1-3 record to go along with a 3.83 goals against average and a poor .887 save percentage. It was a much deeper offensive attack from the Capitals. Bob Carpenter led them in scoring with 10 points while his line mate, Mike Gartner, was a close second with 9 points. The third and final member of that line, Alan Haworth was third in overall scoring during the series with seven points. Gartner led Washington in goal scoring with five goals while Carpenter was tied for second with Dave Christian at four goals. Two of Christian’s goals in this series were overtime winners, in Game 4 and Game 5. Carpenter was also tied for the team lead in assists at six with defenseman Scott Stevens. 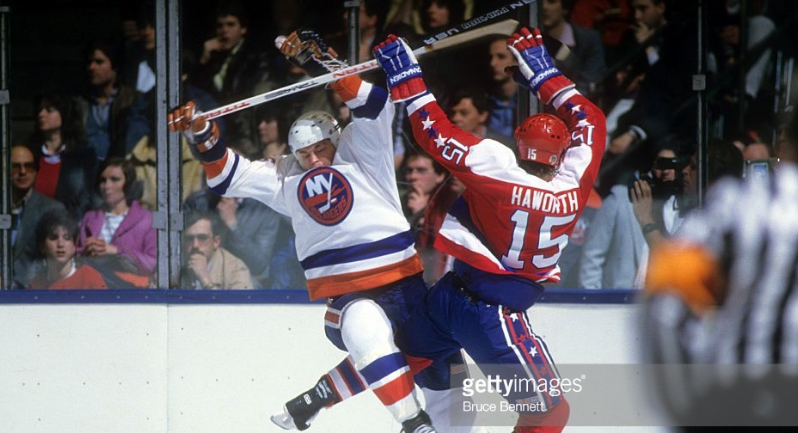 Haworth was tied for second at five assists with defenseman Larry Murphy. Goaltender Pat Riggin actually faired worse than his counterpart, Smith. He posted a 3-2-0 record with a 4.00 goals against average and a .881 save percentage. Riggin was pulled in Game 4 and Washington came back to win it in overtime, so backup Al Jensen got a win in his sole appearance in the series. The ’84-’85 Capitals are the third different franchise to represent Washington in the Ultimate NHL Playoff. After a disappointment in the inaugural UNP where they were ousted in the First Round, the Caps franchise rebounded last year with a surprising run to the Quarterfinal. In the upcoming Third Round, they will either face the 8th-seeded ’92-’93 Pittsburgh Penguins or the 25th-seeded ’09-’10 San Jose Sharks. For the second straight UNP, the ’81-’82 Islanders are representing their franchise and for the second straight UNP, they’ve been eliminated by the Capitals’ representative. The farthest the Islanders franchise has gone in the UNP remains the Third Round, which they accomplished in the inaugural tournament. Up next in the Second Round, the 6th-seeded ’82-’83 Edmonton Oilers face the 27th-seeded ’99-’00 Florida Panthers! This entry was posted in 2nd Round, Ultimate NHL Playoff and tagged Al Jensen, Alan Haworth, Billy Smith, Bob Bourne, Bob Carpenter, Bryan Trottier, Clark Gillies, Dave Christian, Denis Potvin, Duane Sutter, Gaetan Duchesne, Gary Sampson, John Tonelli, Larry Murphy, Mike Bossy, Mike Gartner, New York Islanders, Pat Riggin, Scott Stevens, Third Round, Ultimate NHL Playoff, Washington Capitals. Bookmark the permalink.